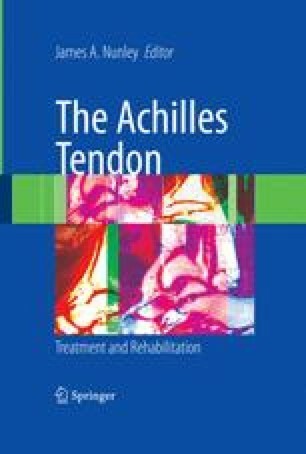 Insertional Achilles tendinopathy is a painful, frequently disabling condition of the posterior foot and ankle. Discomfort and irritation typically arise along the posterior aspect of the heel. As with most tendinopathies, pain begins intermittently and gradually becomes constant as the disease progresses. A common sign of this insertional tendon disease is the patient’s difficulty in wearing closed-back shoes. Athletically inclined patients may report more pain after exercise.